Paintglow Hair Color There are 17 products. 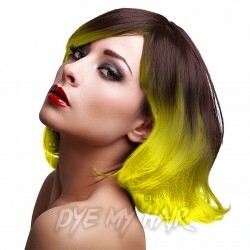 Add a splash of colour to your party style with this awesome Paintglow UV Hair Chalk in Yellow! Your new favourite hair accessory! Add a splash of color to your style with the Paintglow UV Hair Chalk in Red! 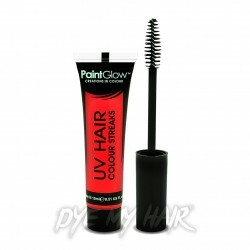 If you're looking to add a splash of Red to your ensemble, then why not try out the Paintglow UV Hair Streaks in Red! If you’re looking to make a statement, then Paintglow is the brand for you! If you’re tired of having natural colored hair and are seeking a safe and quirky way to switch up your look, then Paintglow hair dye is the go-to brand to achieve that perfect neon color! Producing color cosmetics to ISO9001 standards since 2008, Paintglow prides itself on offering the "biggest range of UV Reactive Hair Dye and Glow in the Dark Cosmetics" available anywhere in the World! You can rest assured that you will be stuck for choice when you browse our extensive range of paintglow products! Based in the picturesque outskirts of the Lake District National Park, Paintglow caters to a wide and diverse audience – from veteran hair dye users to those that are new to the process! Offering neon colored and UV products that are perfect for festivals, clubbing, and fancy dress occasions, Paintglow’s extensive range of products will soon become your new go to choice for everything hair color. Made exclusively in the UK, you can rest assured that your hair will be in the best of hands with Paintglow! Here at Dye My Hair we take great pride in offering you an extensive range of products, from Hair Chalk to Hair Streak Applicators. With the help of Paintglow, we’re here to satisfy your every Ultraviolet and Neon needs! Ideal for those on the go touch ups, our extensive range of hair chalks and streak applicators are available in an abundance of eye-catching and striking shades! Your look will never look the same again as you strut your stuff in style with the help of Paintglow. Hair Chalks – Available in shades such as Orange, Pink, Red, and Yellow there will be no stopping your color exploration with Paintglow’s funky range of hair chalks. Being composed of professional quality UV reactive material, hair chalk can be easily applied in the blink of an eye! Totally transforming your look on the spot so you can have the perfect look for those last minute or well-planned fancy dress, clubbing, or festival plans. Hair chalk is a safe and effective method of embracing the freedom to try out a different style every day. Easily washed out with a single rinse, you can say goodbye to long winded dye jobs. Hair Streak Applicators – Ideal for those looking for a compact and effective way to achieve that show stopping look on the go, Paintglow’s extensive range of UV Hair Streaks is a bold and funky way to switch up your style. Perfect for creating a professional finish, the UV Hair streak applicator is the must have accessory for those that are looking to add that extra finishing touch to their ensemble. Glowing vibrantly in the dark, you’ll be sure to turn heads wherever you go, whether it’s at a rocking rave or feveros festival. There is no excuse not to try out Paintglows extensive range of UV Hair Streak dyes because they wash out in a single wash. That means you never have to be stuck with a bad color choice! Perfect for all natural hair shades, Paintglow is the must have solution for ultimate Neon exploration! Whatever your favorite shade, why settle for one look when you can rock an abundance of tones not only in the day but also after dark! Shining bright when charged with a black light, you’re sure to be keen to broaden your dyeing horizons with Paintglow! Keeping your hair in tip-top condition is something that we at Dye My Hair highly recommend when in the run up to using any form of hair dye chemical. Paintglow is renowned for being both dermatologically tested and highly ethical; ensuring that you achieve the highest quality finish. Here at Dye My Hair we understand the importance of quality hair care so we take great pride in providing our customers with products that are of the highest possible standard. So, what are you waiting for? It’s time to get those luminous locks with the help of Paintglow and Dye My Hair! Dermatologically Tested – As mentioned, Dye My Hair is certified as being ISO 9001:2008 compliant. This simply means that all of the policies, processes and procedures in place at Paintglow are of the highest standard. As all of their products are cosmetically certified to the highest standard and dermatologically tested, you can rest assured that your hair will be in the best of hands. Free From Animal Testing – By not choosing to support or engage in the ethically questionable act of animal testing, Paintglow is able to produce high quality products that don’t weigh heavily on your conscience. So, whatever your style, look or budget, you can be sure to choose Paintglow for your next Neon and UV adventure! Guaranteed to take your look to another level, Paintglow products are here to liven up your look in the blink of an eye! Easily applied in an instant, and rinse removable as just as quick, Dye My Hair is the best place to shop for all your wash in wash out hair dye needs! From hair chalks to streak applicators, gone are the days of boring shades! Why settle for mediocre when you could rock a multitude of colors with the help of Paintglow’s extensive range of neon and UV reactive hair dyes! The wait is over, here at Dye My Hair we’ve got exactly what you need! Able to meet all of your ‘dyeing’ needs, our extensive range of luminous, vibrant and show-stopping shades is bound to get your creative juices flowing!